Wrapped inside the gift of blogging is the chance to capture our moments -our lives, our children, our memories- with our words and our pictures. And pretzel twisted to that? Is sharing what we’ve captured with our community. Alison and I swoon for these Memories Captured and would love to place them in our pockets, cozily saved for another day. The next best thing to that? Is to create a link up for Memories Captured with you! Alison wrote a letter to her son which led me to write a version of my own which led us to finding this stunning example on pinterest which led us right here. We want you to capture a moment or a someone that you love in words and photos and share them with us. It’s as simple as that. You capture, we swoon. Choose any format that speaks to you and capture away. The linky will be open December 5th through December 9th. 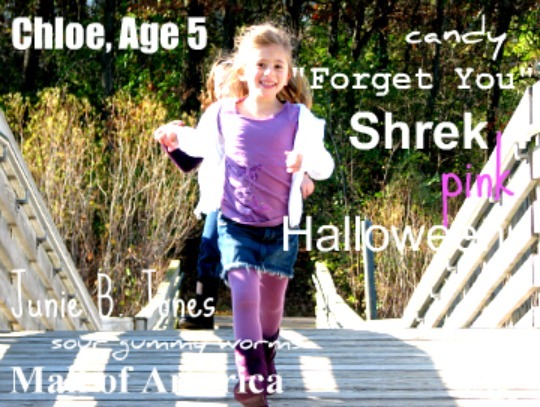 I captured Chloe and her favorite everythings right here using (the free version) of picnik and seeing this? Warms my heart over- twice. Now, it’s your turn! Grab the button below, a photo, and your words, and come back on Monday the 5th to link up! We can’t wait to see what you capture! We’re thrilled to announce that we’re partnering with the fabulous Canvas Press! They’ll generously give one linker a 16 x 20 photo canvas for their Memory Captured! A winner will be randomly picked and announced Friday evening, December 9th. Gorgeous picture, by the way. Hooray, you! I can’t wait to see what you come up with! I’m so glad to be doing this with you, Galit! The photo is perfect and this is such a great way to capture who she is at age 5. I love this idea! That is a precious idea! Can’t wait to try it. Yay! I’m so excited for this! This is a super duper muper idea. You two, clever times 2.so I give you double like back on 5th! Such a cool idea. And? I think I love Junie B. Jones more than my kids do. And thank you so very much, friend! Oh, how funny! Love that! We’re in Eagan- how about you? I love this idea. I’m going to try and get something together and link up! Hooray! I’m so, so very glad to hear that! What an awesome linkup idea! Love it! Hooray! I’m so glad and so excited to see your’s! Love the pic! Such a great idea! That picture is pure JOY!!!! How amazing are you and Alison. I cannot wait to do this! You are so inspring MWAH!!!! Ooh, this could be way too much fun. Love it! Hooray! I’m so very glad and can’t wait to see your’s! Love this, but how would one ever choose just one? Great idea! I will be back on December 5th Fo Sho! One more time for good measure: WOOT! What a great idea and what a fabulous picture! I can’t wait to join in! Hooray! I’m thrilled to hear that! Oh, I SO love this and I’m SO there! Fab idea ladies! Yay, you! I’m so very excited to see what you come up with! This looks fun! Love you ladies!! I just worked on mine yesterday. I love it. Hooray Deirdre! I can’t wait to see it! Oh Galit! This is defintely in the “swoon worthy” category! What a great inspiration for the end of the year. I look forward to linking up next week! I’m so, so very happy to hear that, Jackie, and seriously can’t wait to see what you come up with! Total swoon-fest, this shall be. This girl of yours? Gorgeous in the exteme. Can’t believe I get to have one of my own soon…. Hooray Jenn ! I’m *so* excited to hear that! Beautiful idea! I cannot wait! Total awesomeness! I’m already thinking about what I’m going to put together for my link-up! I just offloaded pictures I JUST took and had one picture that is just beautiful! As I am organizing and saving, I click on this post and providence steps in! Amazing! Working on my post right now. Hooray! I swoon for kismet! I can’t wait to see your beautiful photo! great idea – I’d just found my fave picture of my 7 yr old from when he was a toddler…it’s going up as soon as I finish thanking you for the linkup! Hooray! I absolutely can’t wait to see it! I love this idea. And obviously I am emotionally unstable because I am already crying just thinking about what I am going to do for this challenge! Your Chloe is a beautiful and perfect 5. Amen, sister. I’m all sorts of teary, too!